London is a chaotic city, and most of our lives are spent running from one place to another. In the middle of all this madness, it is refreshing and rewarding to find a quiet place for a moment of reflection. Whether it is a short walk in the park on a Sunday morning or a relaxing cup of hot chocolate after a long day at work, these places will provide the space for an exhausted Londoner to slow down and get lost in thought. They may even give the occasional journal writer an opportunity to scribble a few lines in peace and quiet. Located near the West Boating Lake in Victoria Park, Pavilion Cafe is a great place to sit outside and enjoy a cup of coffee while watching the ducks splash around in the lake. With its warm and friendly atmosphere, this small cafe gives you the break you need after a long walk in the park. The deck area extending into the lake also has the best view of the scenery whether you want to stare off into the distance in silence or take photographs of the lakeside. Breakfast and lunch are also available at the cafe for those who like food as company while enjoying the view. Open every day between 8am-3pm, Pavilion Cafe is in Corner Old Ford Road, Victoria Park, London, E9 7DA. A massive park located in Northwest London, Hampstead Heath is the ideal green escape for those looking to clear their head while wandering aimlessly amid picturesque woodlands. Impossible to leave once entered, the park is home to many bathing ponds and Kenwood House, a breath-taking building with impressive artworks on display inside. So, why not treat yourself to a long walk and a cultural interlude on the weekend as you find answers to life's big questions? The most relaxing feature of the park is the atmosphere of tranquillity; feeling as if you are out of London and in the countryside. Grab your journal, sketchpad or book of poetry and enjoy a shady spot under a tree or put on you hiking shoes to go off trails into the greenery. Make sure to find your way back though! Hampstead Heath, Hampstead, NW3 1BP. Find out more information on Kenwood House here. 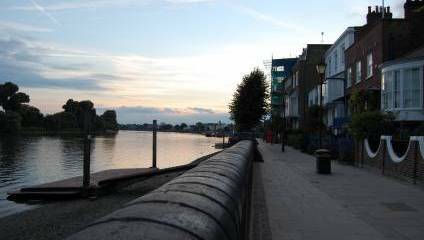 Stretching between Hammersmith Bridge and Furnival Gardens, this riverside walkway is the place for a lovely evening stroll. Whether you want to sit along the Thames or admire the beautiful houses along the way, this part of Hammersmith provides a peaceful space for spending time alone or to take your pet along for the stroll. In the morning, while you can see people rowing along the river, after sunset the reflection of the lights on the surface create a scenic panorama worth photographing. Afterwards, be sure to stop for a pint or to warm yourself at the charming pubs along the river, such as The Blue Anchor. Right next to the Senate House Library and the British Museum, Russell Square offers a secluded getaway in the heart of the city for a short stroll. Broken off from the traffic and masses of tourists that visit the area every day, the park provides a space for people of all interests to escape from their routine and enjoy a moment for themselves. When the weather is warm and sunny, bring along your yoga mat or book, otherwise drop in for a quick breath of fresh air to gather your thoughts during your lunch break. Keep an eye out for the squirrels that are extremely adorable to watch. Just a short walk away from King's Cross, Patisserie Deux Amis is a tiny French-style cafe on Judd Street. With its beautiful interior, friendly staff and delicious coffee and pastries, this lovely cafe is bound to attract anyone looking to spend a calm afternoon reading, relaxing or having a deep conversation with a close friend. As the classical music playing in the background creates a nostalgically cozy atmosphere, Patisserie Deux Amis becomes the ideal spot for the Londoner wanting to get away from the chaos of the city and do a bit of introspection. Patisserie Deux Amis is located on 63 Judd Street, King's Cross, WC1H 9QT. Open Monday through Saturday between 9am-5.30pm, Sunday 9.30am-2pm.